I absolutely adore using my electric pressure cooker, because I can shorten most cooking times by 75%. So, if you don't own a pressure cooker, you can adapt this using an oven, or a slow cooker. Either way, it is the sauce that was so delicious. Best of all, this was not a lot of work to put together. 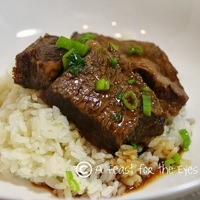 Serve this with some sticky rice, and you will have short ribs that infused with Asian flavors that are really delicious. Recipe comes from America's Test Kitchen "Pressure Cooker Perfection", published January 1, 2013. Please click on the recipe source, to see how I prepared this on my blog, "A Feast for the Eyes". Cook oil, garlic, and ginger in pressure-cooker pot over medium-high heat until fragrant, about 1 minute. Stir in hoisin sauce, soy sauce, sherry, scallion whites, and cayenne, then add beef. HIGH PRESSURE FOR 35 MINUTES: Lock pressure-cooker lid in place and bring to high pressure over medium-high heat. As soon as pot reaches high pressure, reduce heat to medium-low and cook for 35 minutes, adjusting heat as needed to maintain high pressure. NATURALLY RELEASE PRESSURE: Remove pot from heat and allow pressure to release naturally for 15 minutes. Quick release any remaining pressure, then carefully remove lid, allowing steam to escape away from you. BEFORE SERVING: Transfer short ribs to platter, tent loosely with aluminum foil, and let rest while finishing sauce. Strain sauce into fat separator, let sit 5 minutes, then pour defatted sauce into small bowl. Stir scallion greens and cilantro leaves into sauce and serve with ribs. MY NOTES: If you don't own a pressure cooker, you could make this in a slow cooker for about 6 hours, on low. I bought bone-in short ribs, by accident. I felt that the short ribs were a bit chewy. Next time, I'll be sure to buy bone in, OR, I might chuck eye roast, and cut it into large chunks, which is a very flavorful and tender cut of beef that does well with braising. I would double the sauce, it's that good! I like the flavors... looks delicious!